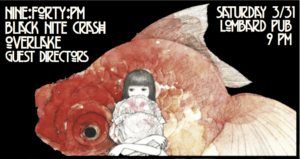 A night of shoegaze-ish bands and beautiful noise at the LoFi Seattle! Overlake returns to the PNW, to be joined by Seattle locals Black Nite Crash, Guest Directors and Nestoria. First band goes on around 9:15. New Jersey's Overlake crosses the country again to continue touring on their beautiful and acclaimed 2017 release "Fall" (listen at the link above). Everyone who caught their set in Seattle last October was blown away - don't miss this one! 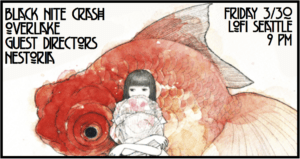 Black Nite Crash released "Nevergreen" (listen at the link above) last year to the delight of long-time fans, and a few "best of" lists. The songs sound great live (as you know if you caught their live KEXP performance last November), and they've also got a deep well of songs to pull from. Guest Directors will be releasing their second EP ON THIS VERY DAY, so you can be one of the first to grab a copy of the limited-edition CD. Expect to hear some brand-new songs on this night as well. nestoria released "monocloud" near the end of 2017 (link above), and are sure to be playing tracks from this EP-with-interstitials. Be sure to get there on time to hear their atmospheric set! How many Fender Jazzmasters can the Lombard Pub hold??? Find out on Saturday, March 31st, with Overlake returning to the PNW (at least 1, possibly 1 more as backup), locals NINE:FORTY:PM (at least 1, possibly 1 more as backup), and Seattle's Black Nite Crash (at least 1, possibly 1 more as backup) and Guest Directors (definitely 2). Portland's own NINE:FORTY:PM have a great woozy and dreamy EP out (listen at the link above) that you'll want to get acquainted with so you can sway with their set. 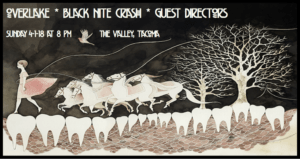 Seattle's Black Nite Crash released "Nevergreen" (listen at the link above) last year to the delight of long-time fans, and a few "best of" lists. The songs sound great live (as you know if you caught their live KEXP performance last November), and they've also got a deep well of songs to pull from. New Jersey's Overlake crosses the country again to continue touring on their beautiful and acclaimed 2017 release "Fall" (listen at the link above). They weren't able to hit Portland on their last visit to the west coast, but now's your chance! Seattle's Guest Directors will be releasing their second EP this weekend, so you can be one of the first to grab a copy of the limited-edition CD. Expect to hear some brand-new songs on this night as well. Follow the Facebook event for details. RSVP at the Facebook Event! You May Die In The Desert! It's always a pleasure to play at the Sunset Tavern!